Every month we speak to women entrepreneurs who have just launched into the business world. In the hot seat for July’s Women Who Launch is Jacinta Collins & Pamela Finn from Hashtag Media. We are the social media solution for business owners; we create stories and curated content and engage with your customers. We have also just launched Social TV in Ireland, where we broadcast live from events / launches / festivals. 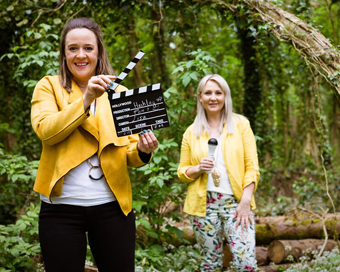 We have a team of Hashtaggers working with us, based all around Ireland, we don’t care if they work from the moon… just as long as the work is complete, they are happy, and the client is happy! Our goal is to open a Dublin office and expand globally. Both of us have our own businesses in PR and Branding. It was a natural progression to move social clients to Hashtag, so we had a base — this grew as our reputation grew. Businesses — of all types, event organisers, anyone that needs help with their social media presence or coverage via Social TV. Pam; Red Bull — they bring a sense of fun into their brand and marry it well with sponsorship, events etc. Discovering our unique product Social TV — We are bringing the broadcast experience to a passive audience. Realising how difficult the overwhelm of social media is for all of us and how we are all affected. Both our team and ourselves reached burnout within months of starting the agency. We now know how to take extra care of ourselves and our team and insist on the switch off at the end of business hours. We promote this to all our followers calling for a switch off every Friday. It is imperative that we have a great front of house and we have our own curator focused on our communication. We communicate our brand message from Instagram as that is our core platform and is the new Facebook. It’s an essential part of our lives and our businesses. We need to constantly keep innovating. We take time to pursue our own creativity. For the most part, we are two mac-tastic, iphone-d, apple guru-d biz ladies who are connected at all times — thrashing out ideas and merging technology, trends and creativity to make business better — Social TV being the best example of our results! BUSINESS MODEL YOU WOULD LIKE TO EMULATE? We have replicated print media in our tiered system. We work with journalists, designers, content engagers… to tell a story — our clients story. Dublin Office — We hope to open one in the next 12 months, we want a creative space similar to Google Culture — work hard, play hard… get creative!! Fly around the world and attend events where we learn… and grow as a team. Social TV — To launch this on a global scale. We want to broadcast live from events. Time is money — we love what we do, so if we get paid it’s a bonus! Creativity as a Source of Inspiration; we are yin to yang — lightening quick, high, infectious energy can be amazing in short bursts. Creativity as a Source of Distraction; we are opposites — Lightening quick, high, infectious energy can be draining in long hauls. Pam — Oprah too. She was told many years ago that she wasn’t suited to working in television — did she give up? No. It will always take longer than you think so don’t be disheartened and DON’T GIVE UP. Everything happens for a reason.